In a previous post I spoke about the pioneer Abraham C. Nisly, who moved to Kansas in 1883. But his story starts long before Kansas with his father, Christian Nisley. He is represented in Abraham’s name by the middle initial, C.
Christian’s story is briefly told in the Family Record of Abraham C. Nisly and his Descendants and Supplement which was compiled in 1971 by a Clara Nisly. I don’t know where Clara got her information, but it says that Christian Nisley came to America from Germany in 1804. 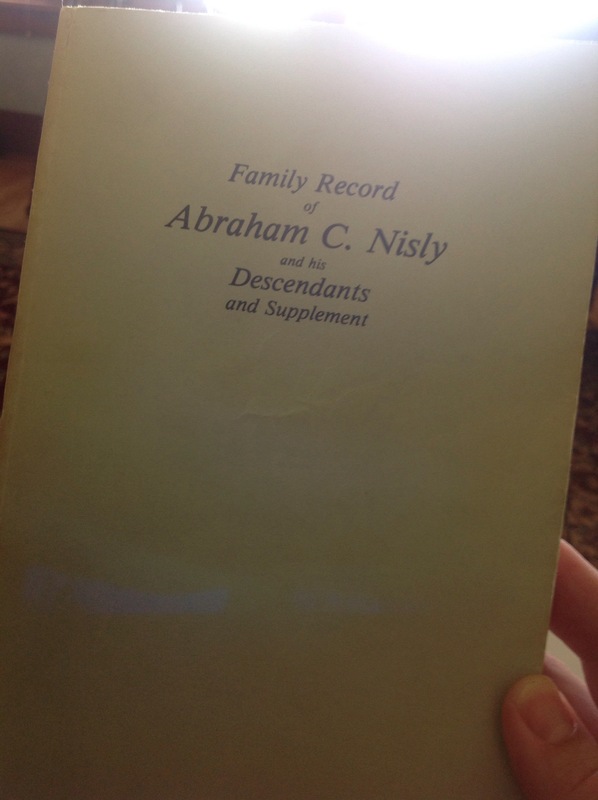 The genealogy book of Abraham’s brother, Peter C. Nisley also has a history of Christian Nisley. It is interesting to compare the two. Christian Nisley, came to America from Germany, where the middle class and poor people did not own any land but all worked for the rich. Always when meeting or passing their master or mistress, they had to stop, bow, and salute them. He left his brother May 7, 1804, went abroad ship June 6, started the voyage July 2, reached open sea July 17, and reached his destination October 12, 1804. His age is thought to be seventeen at this time and as he did not have enough money to pay for his fare, he stayed at Philadelphia until a farmer, Christel Zug, came along who needed help. (To clarify: wanted to hire someone to help him.) Mr. Zug paid Christian’s fare and took him along home to have him work out the debt. Mrs. Zug was displeased with her husband’s choice of bringing home a “Deutsch lump” (German bum), making Christian feel ill at ease in the Zug home. After being in the home for four days, Christian did such a perfect job of churning the butter for Mrs. Zug, that she changed her attitude toward him. Later Christian told the Zugs that he had not dared to eat to satisfy his hunger at first. Christian kept a diary during this time which is in the possession of one of Christian’s descendants. It is written in German and being old, it is not easily read. I will quote most of the information I received about the contents of the diary. They had difficulties at sea, seems like a war ship gave them trouble but released them again, this was early in the voyage. Later a storm did some damage to the ship. It records his marriage and births of their children. A few inheritance items to his children as follows. Christian attended the Amish church in Somerset County, Pa. Here he met a girl by the name of Sarah Miller who he married on June 19, 1807. He was ordained to the ministry and later moved to Holmes County, Ohio. From this Union were born 14 children: Magdalena, Frany, Daniel, Christian, Katerine, Susan, Elizabeth, Anna, Peter, Sarah, Abraham, Christina, Mary, John. The history from the Peter C. Nisley Book is more detailed. Our immigrant ancestor, Christian Nisley, left home in Germany on May 2, 1804 at the age of sixteen. He must have traveled over land some distance, accompanied by his brother, according to his day book, (the diary mentioned in the Abraham book.) which he kept of his travels. He boarded the ship on June 6th but didn’t reach open sea until July 14, 1804, due to the direction of the wind. As soon as they reached the high sea, they encountered an English warship who took part of their crew but later released them. They also endured quite a storm in August which lasted from the 17th to the 19th. On August 24th a storm started at 4 o’clock in the morning and lasted until dark. It was so strong that at the highest point it broke the two high masts of the ship. They finally reached America on September 29,1804, landing in Philadelphia, Pennsylvania. Now young Christian Nisley was in the New World, as America was called at that time. Why did he come? A letter subscribed to the Budget in 1962 by the late Bishop Leander Keim of Haven, Kansas, who was married to a third generation descendant of Christian, tells us there was military training in Germany at that time. Young Christian’s parents, though it isn’t believed by some that they were Amish, must have been strongly opposed to military training. Therefore, they sent their son to the United States by himself and surely didn’t expect to see him again. Another reason he came was because the poor and middle class all worked for the rich people in Germany and didn’t own land of their own. So whenever they passed their rich master or mistress, they had to stop and salute. The young immigrant was believed by some to have been the only Nisley to come to this country, but according to Dr. Philip Swarr, there were Nissleys in America in the early 1700’s. Christian’s parents didn’t have money to pay for his ship fare, but the ship companies brought many young people over at that time and held them in Philadelphia until someone came in and paid their fare. Two weeks after landing, an Amishman, Christian Zug, paid young Christian’s fare and took him along home. Now we’ll take a look at the history of the United States at the time when Christian arrived. Thomas Jefferson was President. He made the Louisiana Purchase from France, doubling the size of what the United States had been. The census in 1800 was five million. Ohio was admitted as a state in 1803. The above post is a draft I’ve had sitting in my blog since October. My interest in historical research has not subsided, but this school year has been very busy for me and I simply haven’t taken the time to sit down and write more about the things I am digging up. I hope to make more of an effort to add bits and pieces in the coming months! Last weekend I had the privilege of sitting down with author and teacher Ervin Ray Stutzman to pick his brain about my vision of a historical documentation of this community in central Kansas as well as a place to store archives and artifacts of this community. Ervin Ray Stutzman grew up in this community and is the author of several books “Tobias of the Amish” and “Emma” which are stories of his own parents in the setting and context of this community. As a transplant to this community 25 years ago, since having read those two books I have been able to understand this place so very much better and have found an identity here as my home and have made it a part of who I am more easily. While the story itself is a narrative of Ervin’s family, the thread running through the books is of an Amish community’s adjustment to modernity through the mid twentieth century. Running deeply throughout the pages is the tension of a community with a strong faith tradition confronted with the inevitable reality of a modern world putting pressure on it to conform to its progress and ideals. So this revelation about this community and our family’s place in it has led me on a further quest to understand its beginnings. This led me to consider the life of one of the very first Amish settlers to come to this Partridge, Kansas community, Abraham C. Nisly, the man buried beneath the grave marker pictured above. Not very much is published about Abraham C. Nisly. In a family record book published in 1971 a short oral history, probably handed down at least two generations, is written down. This sketchy history says Abraham had two wives in his life time, and was the father of 12 children. It says he married in Goshen, Indiana and later moved to Shelbyville, Illinois in 1871. His first wife, Magdalena, died at age 36 when their youngest child was 9 months old. Abraham married again less than three years later to a Dinah Yoder, who at the time of her first child’s birth was 23 years old. The history talks about Abraham deciding to move to Nebraska in 1883, less than a year after is second wife’s death, but a flooded river in Kansas City change his decision to move to a little southwest of Hutchinson, Kansas. It gives a few details of their situation of travel and where they bought land, as well as the inconvenience sharing a tiny house with another large family until the home they bought was vacated. Abraham then dies less than two years after he arrives in Kansas. Only one of his children who were at home was over the age of 21 years old. So this has been the known history since 1971 of a man most people in this community claim as an ancestor or at least has married someone who is a descendant. In fact, Gene’s grandfather and Ervin Ray’s grandfather were brothers. Their father was Abraham C. Nisly’s son. I, for one, believe that this brief history needs further research and should be expanded….and in fact, I have taken up the painstaking process to do so. In future posts I hope to share some the nuggets I have turned up, and maybe by making this public it will generate other small bits of information to the puzzle of the life of this pioneer. In the hills of life there are two trails. One lies along the higher sunlit fields where those who journey see afar, and the light lingers even when the sun is down; and one leads to the lower ground, where those who travel, as they go, look always over their shoulders with eyes of dread, and gloomy shadows gather long before the day is done. This, my story, is the story of a man who took the trail that leads to the lower ground, and of a woman, and how she found her way to the higher sunlit fields. So begins a book I first read as a young teenage girl and then re-read maybe two or three times more before becoming an adult. Next to the old fashioned preteen girl’s Beautiful Girlhood, this book held the most influence in my hopes and dreams and outlook on life. The setting of this story is in my native Ozark hills. For someone who grows up in these hills, there is a burning love for them that never dies no matter how long you’ve been gone from them. There is the beauty of them, of course. But there is something else too…. And a romanticism and idealism of larger than life men and women. All of those hard to put into words feelings are artfully condensed into this masterful telling of a tale by Harold Bell Wright. 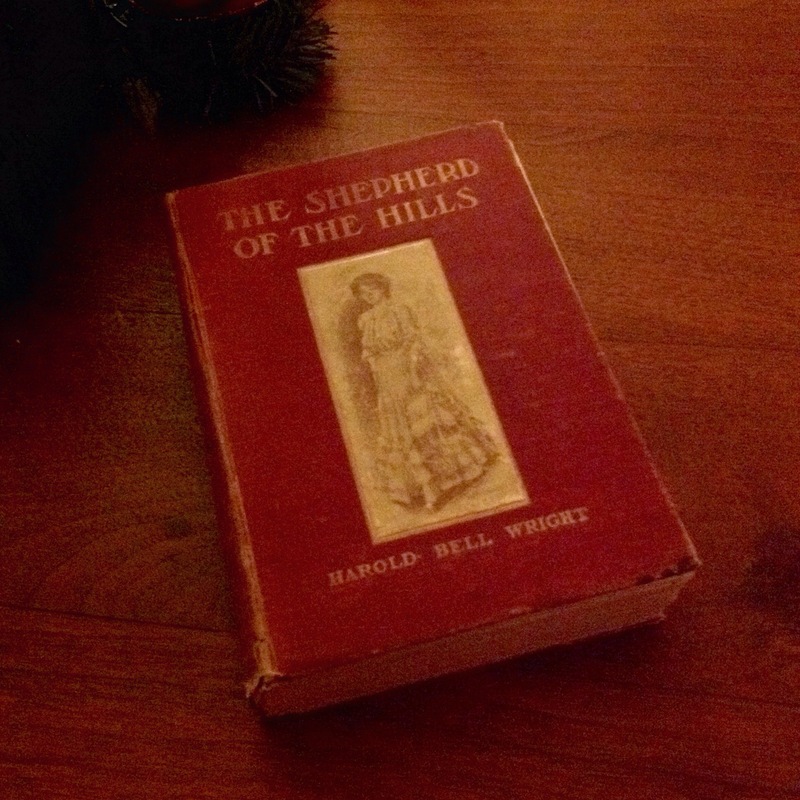 This book, The Shepherd of the Hills,at one time in the early 20th century, had sold more copies than any other book other than the Bible. I don’t believe I had read the book again in the past twenty-five, maybe even thirty years. But, I have picked up several old copies over the years that I treasure. 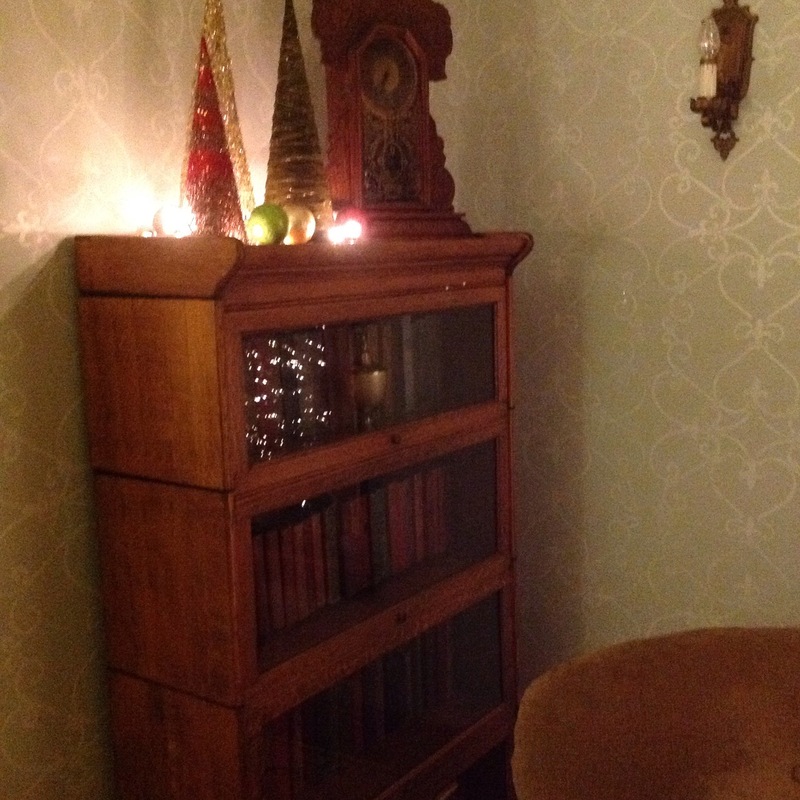 There is something about the romance of old cloth covered books with their fade pictures of Gibson girls and long white dresses, and the fragile yellow pages with their musty smell. My collection of these and other books by Wright as well as other well known authors of that early 1900s rest in a four shelf lawyers bookcase in our living room. Last weekend we spent the weekend in Branson, Missouri. It’s hard to believe, but Cedric was only about 6 months old when we were last there. So that makes it about thirteen years ago. This visit brought back feelings of nostalgia and even homesickness. I remembered my fierce love for the Ozarks and my naive romanticism of this place. “You know all about these things, Dad. And there ain’t nobody else here that does. Will you learn me to be a sure ‘nough lady, so As Ollie won’t – so he won’t-” Again she paused in confusion. It was evident, from the look on Mr. Howitt’s face, that,whatever he saw, it was not this. “I feel somehow like I could do it, if I had a chance,” she murmured. And like her, How little I realized how much I really had…. As I read this story again, I realized how very differently I read it now then when I was a teenager. As a girl I read it with all the idealism and hope of a perfect future. Sammy Lane and Young Matt were perfect, the apex of humanity. This was who I wished to be…This is who I would be. But it’s funny how real life works out. Harold Bell Wright, when he wrote this moving tale in 1906 he dedicated it to his wife of 7 years, Frances. In memory of that beautiful summer in the Ozark hills, when, so often, we followed the old trail around the rim of Mutton Hollow – the trail that nobody knows how old- and from Sammy’s lookout watched the day go over the western ridges. Yet, ten years later, they were divorced. In the book, Sammy Lane stays in the hills and marries her perfect match, Young Grant Matthews. She is the quintessential lady; lovely in form and figure even after a row of perfect children. Her home reflects the beauty and dignity of the sure’nough lady she had become with its lovely and carefully arrange furnishings. It is a book after all. But, I did pick up on a theme that I don’t remember noticing before. That is that sometimes people can go on both the high road on the sunlit hill tops and the low road into the shadows. Then the man with the proud face, the face of a scholar and a poet, drew back from the window, shaking with a fear he could not control. He crept into a corner and crouched upon the floor. With wide eyes, he stared into the dark. He prayed. And this is how it came about that the stranger, who followed the Old Trail along the higher sunlit ground, followed, also, the other trail down into the valley where the gloomy shadows are; there to live at the ranch near the haunted cabin- the shepherd of Mutton Hollow. I suppose I missed this when I was eighteen because I didn’t realize how much truth it was. I also had managed to miss the main theme of the book until now 30 years later. Who but He that looketh upon the heart of man could know the battle that was fought in the soul of that giant of the hills? He uttered no sound. He sat in his seat as if made of stone; save once, when he walked to the end of the porch to stand with clenched hands and passion shaken frame, facing the dark clump of pines on the hill. Slowly the moon climbed over the ridge and lighted the scene. The mountaineer returned to his chair. All at once he raised his head, and, leaning forward, looked long and earnestly at the old shepherd, where he sat crouching like a convict awaiting sentence…..
And redemption….always, redemption. For a middle aged girl still wanting to be a sure ‘nough lady, it’s sure what I need. It is high time I make good on my resolve to write in this blog. I seem to have developed some sort of writer’s anxiety. I have started multiple posts in my head and even started one that is now sitting in Drafts neglected and unfinished. Apparently writing is significantly more difficult when you think about instead of just doing it. That said, I have enlisted some help, I hope, in the form of some reading material. That sounds promising doesn’t it? How to Be a Writer in 7 Days….Develop Your Craft While You Sleep….or, I really like the sound of this title; How to Write Deep and Inspiring Thoughts With Constant Interruption. Well no, those sources don’t actually exist as much as I wish they did, but I have gotten my hands on these books, One Year to a Writing Life, by Susan M. Tiberghien and, Writing Alone and With Others, by Pat Schneider and The Writing Life, by Annie Dillard. The Writing Life is as I suspected about writers. They really are pretty much possessed…in a good way no doubt, but nevertheless, possessed. I’m not sure I qualify, or want to qualify anyway. Writing Alone and With Others is a nice encouraging book about how to find your voice either on your own, but especially in an accepting group context. Jumping into the blogging mania hardly seems encouraging or accepting, but it will have to do at the moment. One Year To a Writing Life, is so far the most promising with 12 practical lessons to improve your writing. But there are small exercises to accomplish in each lesson as well. Incidently, the first lesson to deepen a writer’s art and craft is journaling….How about that! Journal everyday she says, first thing in the morning. Who knows, maybe there is something to developing your craft while you sleep. I can’t remember the first time I thought about starting a blog. But has been a while ago. It’s been something that interests me but terrifies me. I read other people’s blogs and they seem so perfect and they write so well. How can I possibly compete? But the thought has hung around. Every so often I have done my typical self educating on it….checked out Pinterest… looked for online blogging and writing classes… audited an online photography class…. clicked through You-tube tutorials… picked up books on writing…read articles on how to organize your blog schedule…how to blog to make money…how to blog to boost your business…. Finally it’s like; Good grief, how am I going to do it if I don’t just do it? So. Here I am and it’s not that hard to get started…it’s really not. A place to encourage and see real life as a blessing. Because the Holy Ghost over the bent world still broods.